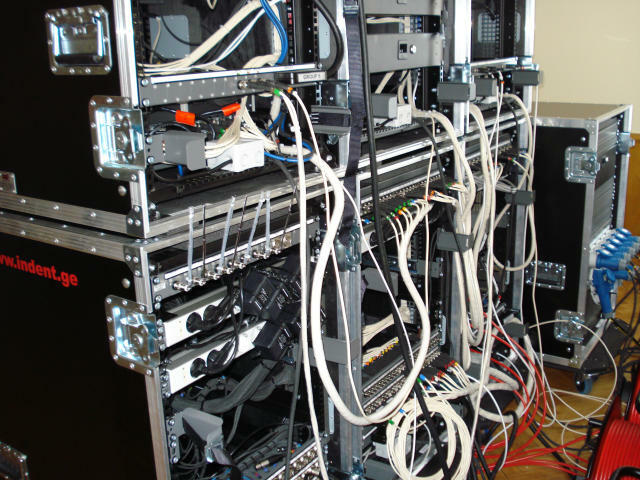 The mobile system is assembled in 7 cases, in which all basic equipments are placed. For transportation of cameras, tripods and accessories in addition 6 cases are used. All cases are shock mounted, consequently the equipment gets the minimum jolting at transportation, and it positively affects its efficiency. Besides, all cases are equipped with castors for ensuring convenient movement. Any case (big or small - 12U, 18U) can be carried by two persons. The allocation of all system by technicians on the point is possible within 45-60 minutes. The system can be used in stationary conditions and in a mobile variant as well. 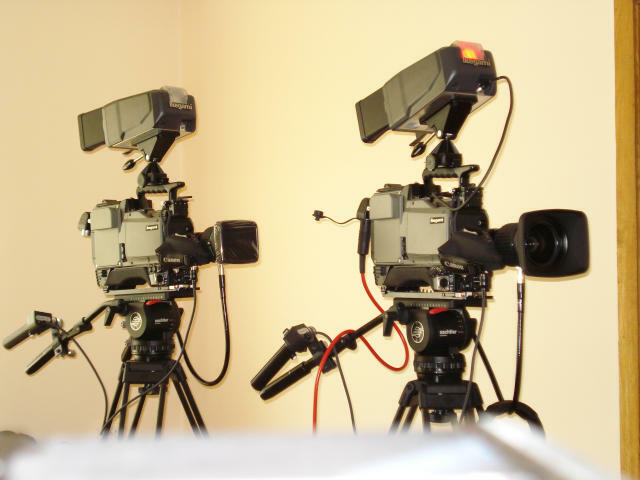 The system includes 4 Ikegami cameras with corresponding camera channels and triaxial cable. Cables are Klotz (length 3х150 m and 1х200 m) and connectors - Fischer. All cables are completed by corresponding drums. 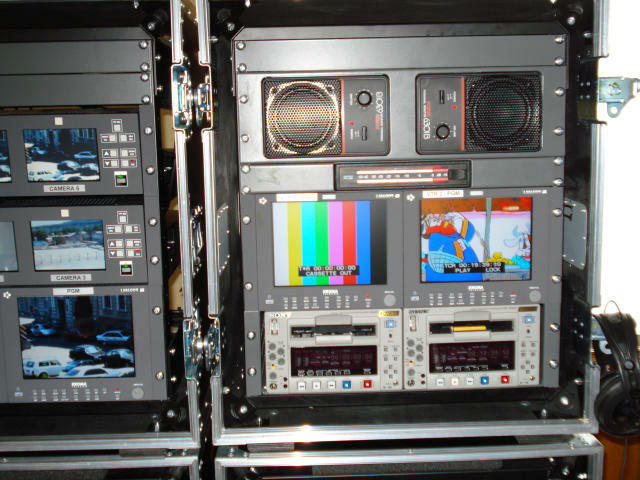 The system also has capacity of connecting 2 cameras in addition by SDI interface. Ikegami 60AW is a digital camera with 12-bit A-to-D conversion. The camera has possibility of switching on 2 formats - 4:3/16:9. Lenses - Canon: 3 pieces - 20-x and 1 piece - 13-x (wide-angle). Sachtler tripods are used: 3 pieces - "System 18+NG" and one piece - pedestal tripod - "Pedestal CIII", as on it except the camera is located teleprompter Autoscript "VinPlus" with 17' flat monitor. The prompter system is realized on the basis of the laptop. 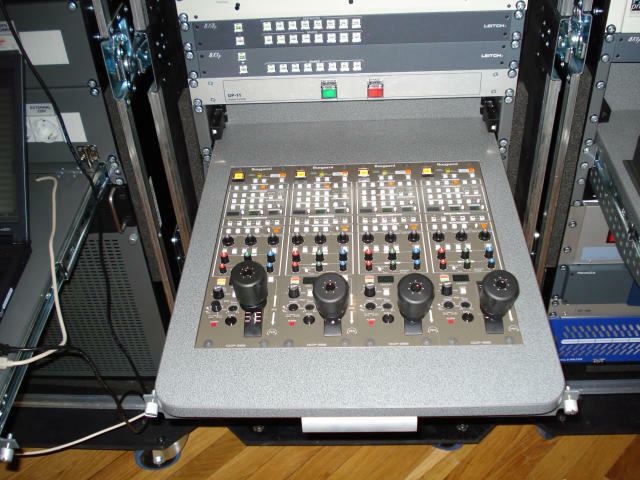 In system is used video mixer "GVM-90" manufactured by "GURAMEX" with 9 inputs, 1 - DSK, 1 - Key, 1 - Logogenerator. The mixer has SDI interface. The control of input signals is carried out on a composite. 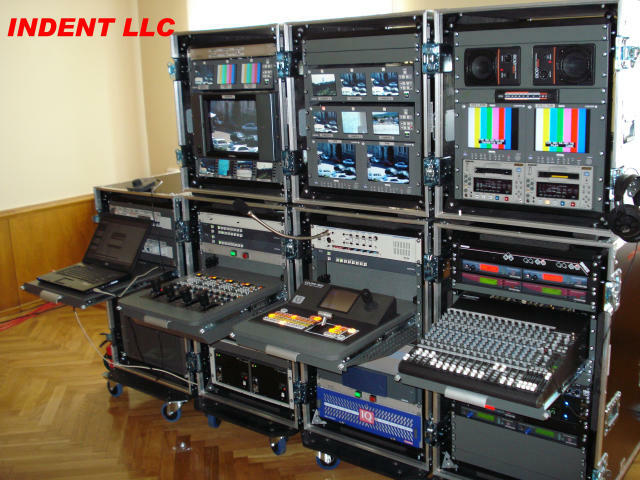 In parallel with a video mixer the system is equipped by Leitch audio-video router with 8х8 set possibility. The router provides distribution of a signal to different users, also it carries out function of emergency switcher at failure of the basic mixer. This router is operated by 3 portable remote panels (8х8, 8х1, 8х1) located on workplaces of the engineer and the producer. The output signal of the program from a router and a mixer is given to emergency roundabout switchboard, which at failure of the basic video mixer is automatically switched to a signal of a audio-video router. 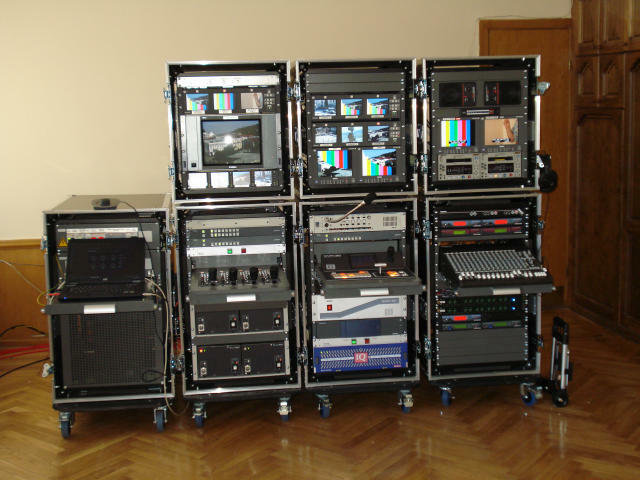 Audio-video record in system is carried out by 2 tape recorders DSR-1500 of firm Sony equipped with SDI cards. The visual control is carried out by 2, 3 and 4 screen panels of firm Kroma. All system is attached to sync pulses of the generator of television test signals (BBG). BBG, frame synchronizers, converters and distributors are assembled as modular system and placed in one 3RU basket with two power units. It is a modular system manufactured by firm Snell and Wilcox. As Intercom system is taken 4 channel station of ClearCom, which provides a reliable communication with cameramen. As the basic audio mixer is served 16/4/2 mixer of Mackie. The audio control is carried out by 2 audiomonitors of Fostex. Communication with TV presenters is carried out by means of wireless radio systems. In addition, the system is equipped by clip microphones, handheld microphones and multipurpose desktop radio microphone systems. 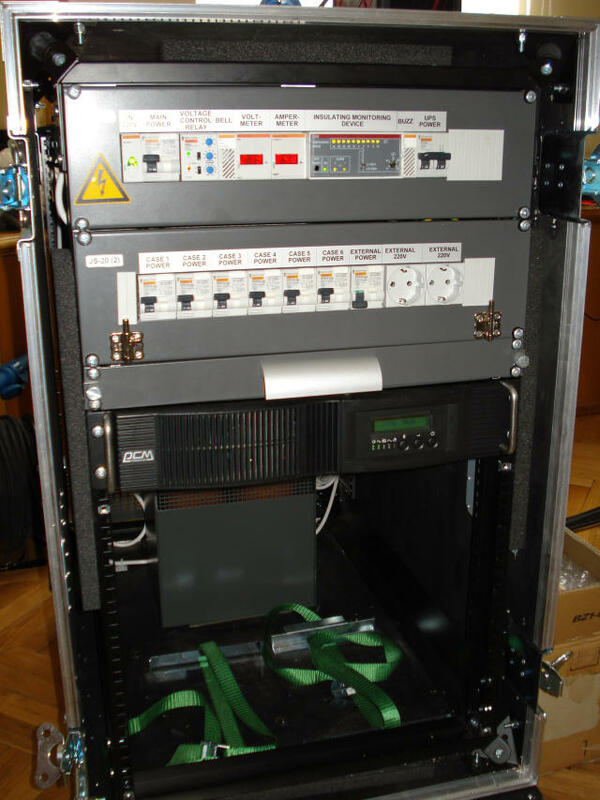 Processing of audio signal is performed by the equipment of LA Audio and DBX. Communication with external telephone lines is carried out with the help of 2 channel digital phone hybrid of Comrex. The control and measurement of audio signal is made by means of the control device of RTW-Telex. Power supply of mobile system is carried out from Smart UPS, which provides uninterrupted work within 10-15 minutes, that is quite enough for transition to the alternative power supply.